The train rumbles through the market, almost but never quite touching the goods. So long as the health and safety people are never allowed anywhere near. A delightful example of this is the Mae Klong market in Samut Songkram province, west of Bangkok. 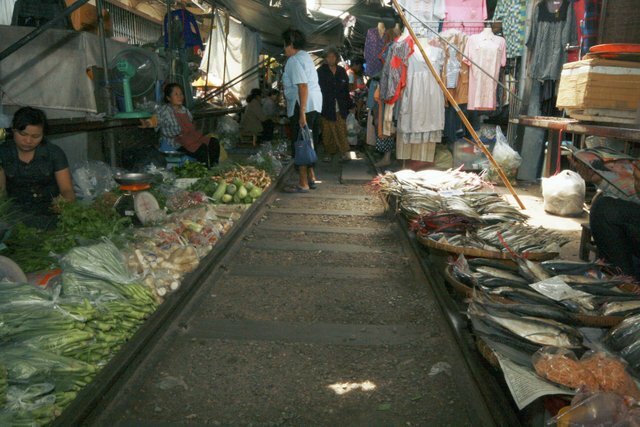 A rail line runs right through the market. 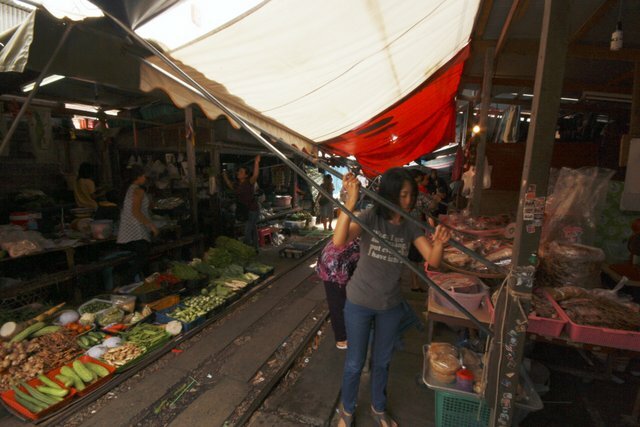 Stallholders, not willing to give up a single inch they didn’t have to, sell their goods right next to the track – actually touching it – and hang awnings over the track to keep the sun off their fish, fresh vegetables, desserts, clothing, or shoes. 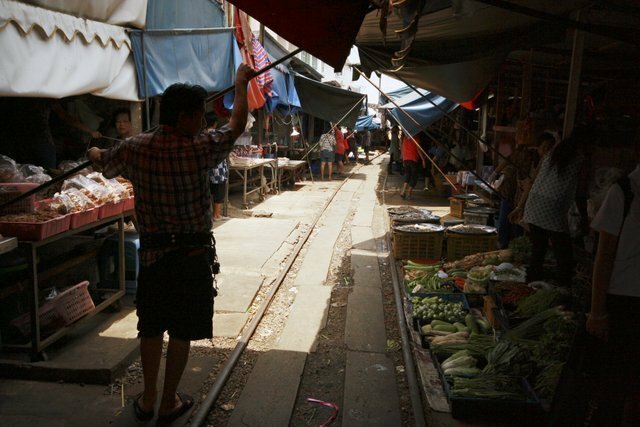 Approach the market from the railway station that stands between it and the Mae Klong River and it looks as though there is no way a train could go through; the tracks simply disappear into the shade under the awnings. But it does. The track is a convenience for shoppers. They can follow it through the market. 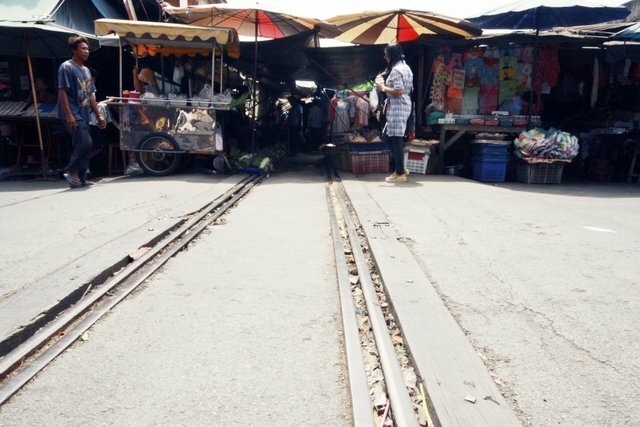 The space between the rails, which belongs to the rail company, is never infringed on by the vendors. When a train comes through, which is about eight times a day, an astonishing transformation takes place. Alerted by a couple of toots on the horn from the train, and with complete aplomb, the vendors pick up their trays full of goods and move them back, then move their awnings out of the way. Some don’t even bother to move the trays, which they have filled to precisely the height where the part of the train overhanging the wheels will simply glide over the top of the goods with a couple of centimetres to spare. The diesel train with a couple of coaches in tow rumbles past, and as soon as it has done so, the awnings go back out over the track and the trays are put back in place. In 20 seconds you’d never know there had been a train there. It all happens so swiftly but calmly that it’s almost disappointing, yet at the same time close to magical. The line ends at the station, so 15 minutes later the whole process is repeated as the train comes back the other way. No one seems to feel this is the slightest bit dangerous, or even out of the ordinary. After all, the players get plenty of practice, and it’s as routine for them as taking off and putting on a pair of shoes. Those most at risk are probably the tourists with cameras glued to their faces. But if they look as though they might be hit, the vendors pull them gently out of the way. To get to Mae Klong, take Route 35 west out of Bangkok about 50km. 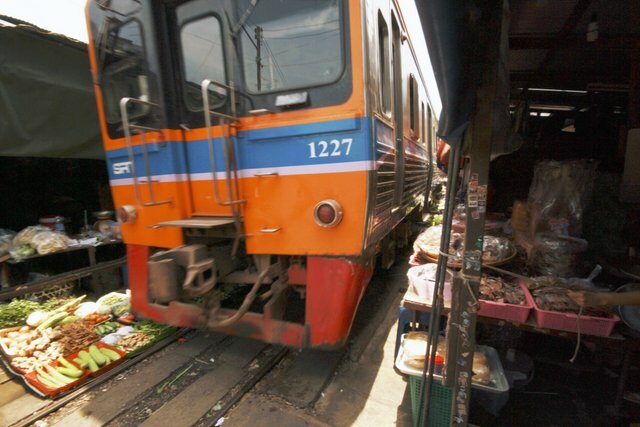 Or take a train from Wong Wian Yai, which takes you through the market.